The most cherished school of selector-educators is back in session with the latest Finders Keepers release giving a masterclass on the seminal fringe Jazz BYG label. 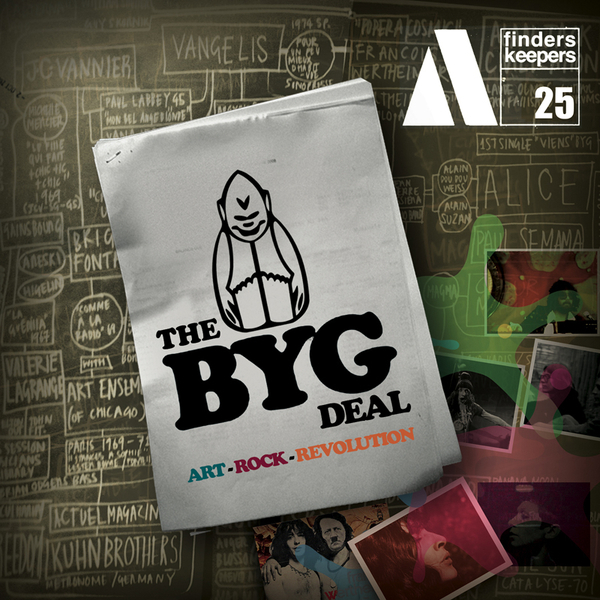 Hailed as the catalyst of the French underground scene, BYG was born from the ashes of the 1968 student revolts, when three record industry gents were inspired by a rush of creative freedom sparked by the revolution, giving impetus and shape to their collective love of American jazz and blues, psychedelic rock and many subsequent styles. The label was an early home to records from monolithic touchstone artists like Vangelis, Art Ensemble Of Chicago, Gong, Brigitte Fontaine, Don Cherry and members of Soft Machine, Procol Harum, MAGMA besides many more, acting as a deeply rooted jazz and blues imprint, with a keen eye on the happenings occurring at the fertile edges of the scene. The accompanying sleevenotes are reliably thick, covering the initiation of the label and detailed notes on each track and artist for your perusal, but it's really all about the fantastic music, no? Be prepared to sink your head deep into stunning early works from Alpha Beta, the first incarnation of Evanghleos Odyssey Papathanassiou, better known to Bladerunner and synthesizer fans as Vangelis (as well as his later self-titled work), next to magickal drone folk from Gong, avant-funk from Art Ensemble Of Chicago, Brigitte Fontaine's raunchy fonk-rock or even British pop legends Procol Harum v1.0 aka Freedom. All freaky folk and world-tripping psyche pickers need to sign on the bottom line...Highly Recommended.